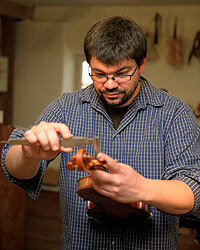 Dominik Hufnagl's violin making workshop was established in Markt Wald in the Lower Allg�u, Germany in 2002. Dominik Hufnagl is a master craftsman in violin making, trained to be and working as a violin maker untill taking his master craftman's diploma in F�ssen, Germany. Pierre Chaubert was his teacher. Hufngl established his workshop after taking his diploma. Jointly with his team of experienced violin makers and supported by his wife who is responsible for renting, administration and marketing, he mainly manufactures new instruments apart from repairing string instruments. "My violin models follow the lines of a violin by Antonio Stradivari, made in 1715. The masterly model, many years of experience in making new instruments, a sensitive approach and intense exchange of views with musicians are united in the elegance of shape and tonal strength of every tailor-made new instrument." Being a member of the NewStrad family, we manufacture high-quality soloist's instruments individually for each musician. Made with the help of a world-wide unique method of sound optimization, these instruments feature in particular, next to an excellent variety in sound, also robustness, resistance to climatic influences and absolute reliability. Combined with the violins' great sound and their excellent vibrational behaviour, these violins are the ideal sound tools also for use in open-air events. "It is our main intent to work on the quality of the instruments. Direct cooperation with the musician ensures optimum sound production and best playing properties for his instrument." J�rg Meyer has been an independent master violin maker for 25 years. He is an accepted member of his guild, seated at Ehrenfriedersdorf in the German Erzgebirge. "Starting point for selecting my profession was my early love of music, which I could develop for several years by taking lessons on the viola and the piano." In 2001 he was awarded the Deutsche Musikinstrumentenpreis (German Price of Musical Instruments) in the field of violins. 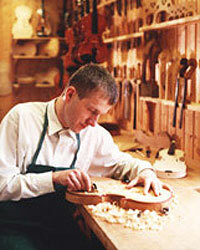 The violin maker has been an untiring supporter of the NewStrad family from its very beginnings. With his wealth of experience in repairing violins, violas and violoncellos as well as manufacturing new ones, J�rg Meyer comes up with important advice and ideas on how to constantly improve the variety of sounds of the NewStrad violins. "Cooperation in a number of international research projects gives me the chance to constantly improve my working methods and knowledge. In my opinion, cooperation within the NewStrad family is an essential step towards coming as close as possible to the vision of beautiful sound and sound variety."